The reason behind the brawl might rank among the dumbest of all time. Cruises are synonymous with many things: travelling the world, cabaret singers, buffet food and occasional bouts of norovirus. One thing you don’t necessarily associate them with, however, is brawling. But that’s all changed after footage from a series of mass fights aboard the Carnival Legend cruise ship found its way online and it’s astonishing to watch. The incidents took place somewhere off the coast of Australia and, according to the Associated Press, were instigated by a “big Italian family” of 20 who were involved in multiple incidents during a 10-day trip around the South Pacific. Lisa Bolitho, a passenger on the cruise, told reporters that people were “getting strangled and punched up” on the ship during a series of “very violent” and “full-on attacks”. 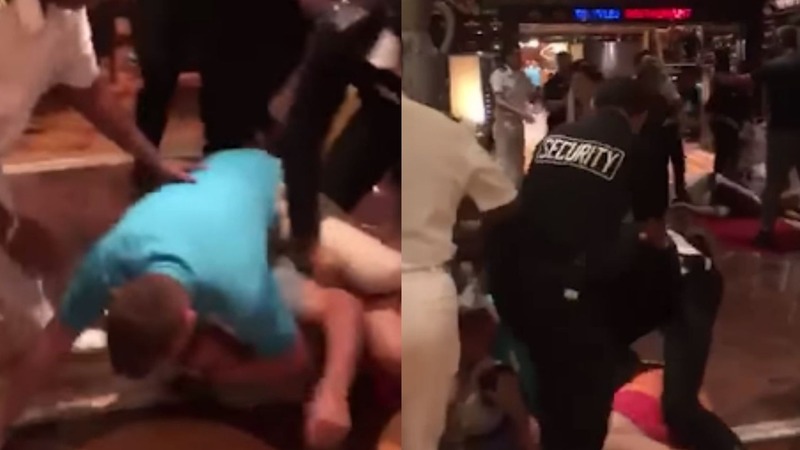 In two separate clips uploaded to YouTube, passengers can be seen pushing security, throwing punches and generally scrapping amongst each other while white-clad cruise ship workers and security guards weigh-in to try and calm the situation. It sparked mass panic among other passengers, many of whom made a dash for the relative safety of their cabins. In any case, those at the centre of the disruption have been kicked off the cruise over the debacle with is either horrifying or hilarious depending on your viewpoint. What makes the entire sorry scenario that bit more bizarre is that the entire brawl was sparked off by an incident involving flip-flops, or thongs are they are rather confusingly called Down Under. One of the passengers booted off the cruise, a man known only as Zac, revealed that the fight started when someone accidentally steps on another passenger’s flip-flop. Zac claims his nephew was threatened by another passenger as a result of the incident and that security on board the cruise had been bothering the group throughout their holiday. Carnival Cruise has since offered to give passengers credit to cover around a quarter of the cost of their next cruise. It seems unlikely that anyone involved is going to end up taking up that offer though. Maybe try a safari next time? At least the lions would be game for a fight.